Click here for shots of the Howling Griffons in action! I always wanted to do Howling Griffons, and as incentive, my friend Ed purchased and base coated models just for that purpose. 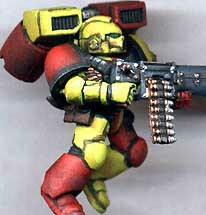 This scout is not quartered, but does use the traditional red and yellow colors. To try something new, I went with white hair on the models. I used fairly muted colors for his equipment to offset the armor. I shaded the yellow with light brown, and the red with dark brown, which adds a lot of depth to an otherwise stark scheme. 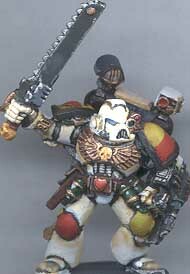 This Sergeant model is a conversion of the one in the cmd. squad- I replaced the Auspex with a chainsword. I prefer the "double quarter" pattern, where the upper and lower limbs are differnt colors. The original Howling Griffons (unlike the new ones ) were painted this way. 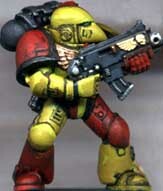 Did I mention that the new plastic marines are really nice? This model is stock, but posed up well. I decided that for the helmets, I'd just split them in half to match the upper torso, since it contrasts well with the shoulder pads. Black and brown washes show the panel lines and grunge the model. Just 'cause you have bright heraldry doesn't mean you can't get filthy! I just love that pose! Although I have an old Bretonnian decal sheet with griffons on it, I'm running low and most of them are too big to fit on a shoulder pad, so I used some winged claws for most of the troops. Due to the predominance of red, I have painted the purity seal green for contrast. You can clearly see the split torso colors in this back view. 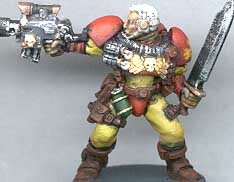 Although the split line is clean, the overlapping plates and seams are still good candidates for grungy brown washes. I have stuck with my traditional dark grey and steel colors for the backpack and weapons. I made my own grenade laucher out of a new plastic ork shoota and some tube styrene- check the CONVERSIONS page for quick directions how to make your own! 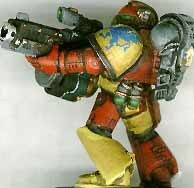 The plastic tactical marines pose well, even with a massive weapon like this- just open the left hand up to fit, and aim the head along the gun. You can really see the upward aiming pose, achieved by leaning the body and head to the right to elevate the gun without raising the left arm too high. Also note the spare grenades on the hip. I painted the weapon dark grey and black, with metal details. To make the drum stand out, I added a white stripe, a green band, and a brass back end to each tube. 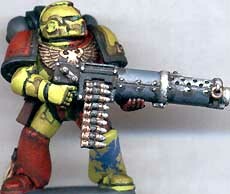 We include Heavy Stubbers in our list of special weapons available to marines, so I spliced a couple of the new plastic ork shootas together to make this heavy stubber. The Mk. 6 style leg (no kneepad) was big enough for one of those Griffon decals I mentioned earlier. 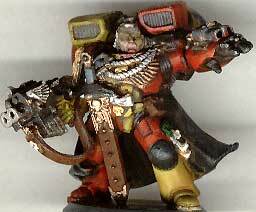 To help bulk the model out, I added a knife and an extra belt of ammo (also from the ork plastics). 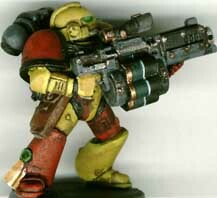 I used the regular bolter arms, and simply bent the hand open wider to fit around the barrel of the heavy stubber. 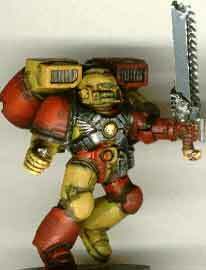 The first of the assault marines, with the same heavy stubber conversion. I quartered the jump pack to match (though the center section is dark grey like the normal packs). 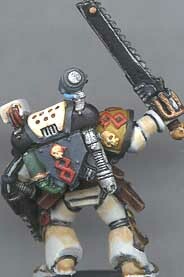 In addition to a jump pack equipped version of the grenade launcher guy, I've done some other assault squad models, like this chainsword wielding fellow. For the right arm, I used the grenade holding arm from the new assault sprue- it poses quite well! The new assault squad sprue is a must have, with loads of cool details like this, plus dynamic leg poses like this one that can easily interchange with regular marines. 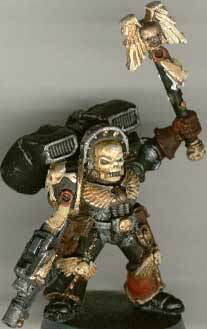 This guy is painted the same as other models, but with a dirtier dark brown wash than usual. Ed and Robert are generous with their models, so I was able to do a jump pack equipped Chaplain (and medic below) expressly for the Howling Griffons. 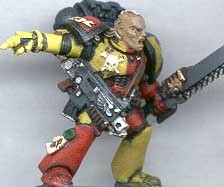 As a result, this model (originally the Blood Angels Death Co. Chaplain) has an Auxiliary Grenade Launcher added to his bolter, and his left leg is painted red and yellow halved, as is the left shoulder (not visible here). I used a steel to highlight the edges of his armor, and brass for all the trim, plus heavier brown washes than usual to give an otherwise monochromatic model some nice color depth. 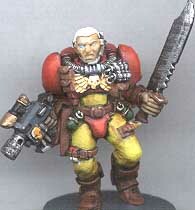 I painted this stock medic from the command squad with Howling Griffons colors. The left shoulder is quartered, and the kneepads alternated. To offset the bright colors, the weapons and equipment are painted with dark grey and black. I usually paint chest eagles white, but for the medic, I went with brass shaded with brown to contrast with the white armor. I used light brown to shade the white. A back view of the medic. I used black and dark grey for most of the backpack. 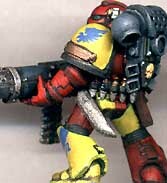 The left shoulder is stock, painted yellow with black trim to match the right shoulder (the standard scheme for our Howling Griffons).